Even though wages today are higher than they were in the ’70s, after you account for inflation these are only marginally better. At the same time, productivity has almost doubled according to a reported issued by the U.S. Census Bureau. 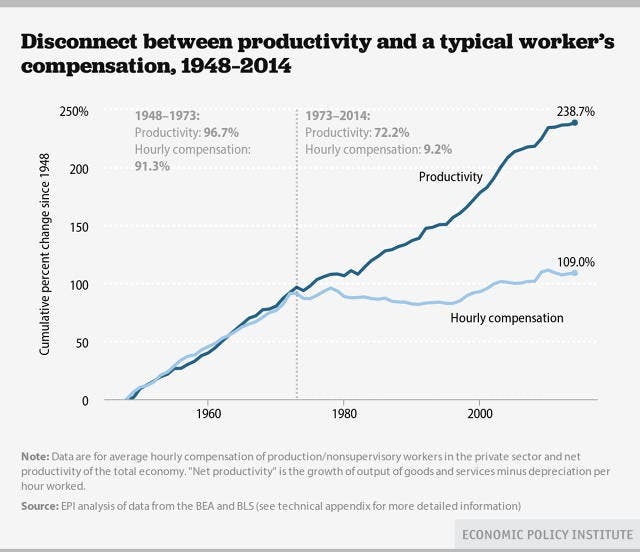 In other words, despite the economy has significantly grown in the past 40 years, American workers got a pay cut – not a raise. 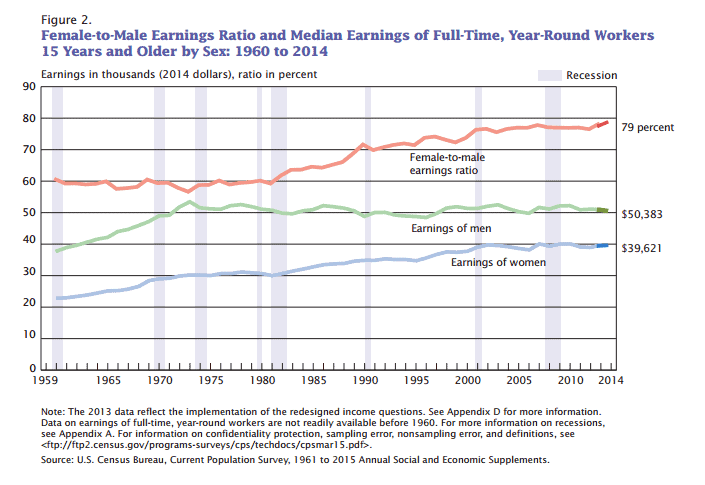 In 2014, the real median earnings of men ($50,383) and women ($39,621) who worked full time, year round were not statistically different from those in 2013 (slightly lower), nor 2009 for that matter. But while women earn considerably less than women, the gap has steadily narrowed. While the report is focused on measuring poverty in the US, the data pertaining to median wages paint a grim picture of income inequality. Increasingly, America has became the land of opportunity – only for some. It’s no surprise anymore that the U.S. ranks among the lowest of all developed countries in terms of the potential for upward mobility. The U.S. has the fourth-highest income inequality among the world’s developed (OECD) countries—only Chile, Mexico, and Turkey rank higher. In terms of wealth inequality, it is the fourth highest in the entire world (trailing Russia, the Ukraine, and Lebanon). We’re living the age of the “1%” or “0.1%”. If you’ve been born poor, you’ll likely to stay poor, considering the latest figures. Clearly these issues need to be addressed, but how? Some propose simply trying the ol’ Robin Hood routine, only the stealing from the rich would be done a lot subtler: taxing more. Of course, some are critical: it would be against the American spirit of free market trade and would hamper innovation. Maybe. At the same time, it only seems like common sense when a company goes through periods of prosperity that the income is more equally distributed. Taxes aside, one can point to broken down unions as an important factor which has contributed to income inequality. In the 1960s, almost a third of U.S. workers were unionized. Today, it’s less than 10%. Alone, workers are weak and can’t fight for their rights. Another solution might be basic income – an unconditional monthly stipend awarded to all citizens with no strings attached. This should be enough to cover basic living expenses so people can focus on becoming more productive. The right is opposed to this, however, and while some governments are experimenting with the idea seeing positive results, I have a feeling the US (or its politicians) is years behind grasping the idea. In 2014, the official poverty rate was 14.8 percent. There were 46.7 million people in poverty. The poverty rate was 2.3 percentage points higher than in 2007, the year before the most recent recession. Some more key findings from the report. 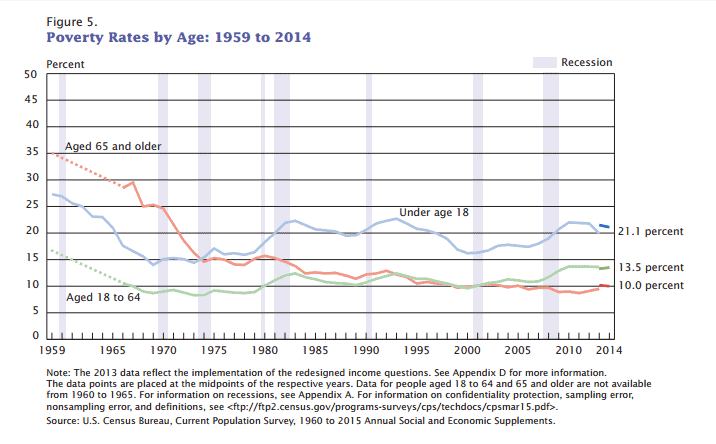 The poverty rate in 2014 for children under age 18 was 21.1 percent. 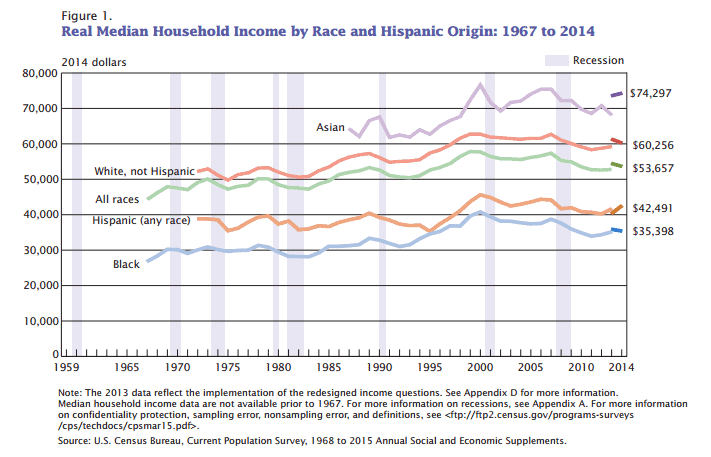 Non-Hispanic Whites accounted for 61.8 percent of the total population and 42.1 percent of the people in poverty. For Blacks, the 2014 poverty rate was 26.2 percent and there were 10.8 million people in poverty. For Asians, the 2014 poverty rate was 12.0 percent, which represented 2.1 million people in poverty. Among Hispanics, the 2014 poverty rate was 23.6 percent and there were 13.1 million people in poverty. In 2014, the poverty rate and the number in poverty were 12.6 percent and 7.0 million for the Northeast, 13.0 percent and 8.7 million for the Midwest, 16.5 percent and 19.5 million for the South, and 15.2 percent and 11.4 million for the West. The poverty rate for those who worked full time, year round was 3.0 percent, while the poverty rate for those working less than full time, year round was 15.9 percent. In 2014, 28.9 percent of people aged 25 and older without a high school diploma were in poverty. The poverty rate for those with a high school diploma but with no college was 14.2 percent, while the poverty rate for those with some college but no degree was 10.2 percent.